Social Media Marketing World, hosted by Social Media Examiner, is the world’s largest social media conference. Over the course of 3 days, 3,000 attendees hear from 100+ of the world’s top social media pros as they share their transformative ideas on social. It makes sense, given the expertise of the audience, that the team managing the social for this conference must be ready, willing, and able to engage with their customers on all channels, including platforms that are just emerging in the field. So how does one interact on social with several thousand social pros? For Erik, it’s all about training for the social marathon. He has a system locked in for pre-game, during, and post-game social that ensures every one of his 3,000 customers is taken care of in the channel of their choosing. He keeps an approach that is rigid enough to withstand the most torrential storms of social engagement while maintaining a degree of flexibility that allows them to adapt quickly and easily to new platforms as they emerge. Under his leadership, the world’s largest social conference has become one of the best for social pros near and far. In order to best serve your base, you need to think like a consumer first and a marketer second. 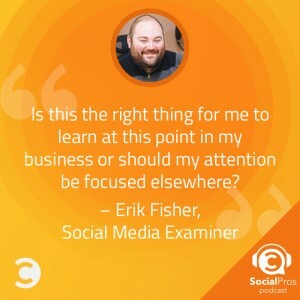 Only by connecting and using social from a personal perspective can you ever really, truly understand the best way to use these tools. As a huge U2 fan, Erik’s first choice would be a Skype session with the one and only Bono. He has so much experience in music, philanthropy, business, and branding that a conversation with him would be a fantastic learning experience.